As a mom of 3 boys I have always found it hard to find cute boy accessories, but no more. Pea Soup offers the cutest accessories for boys & girls. Pea Soup custom designs and manufactures a beautiful line of specialized accessories for girls and boys. We feature a full line of hair accessories including pinch clips, snap clips, ponytail holders and headbands, each adorned with innovative embellishments and beautiful trims. Carefully placed inside each pinch clip is a piece of soft velcro to help keep them in place.Pea Soup specializes in great layette and giftware - adorable for girls, exciting for boys! Our socks, baseball caps and bucket hats are embellished with designs that range from sweet and classic to fun and hip. Whether it's a chenille baseball, crocheted train or a silk rose, a Pea Soup accessory is the perfect addition to any outfit! 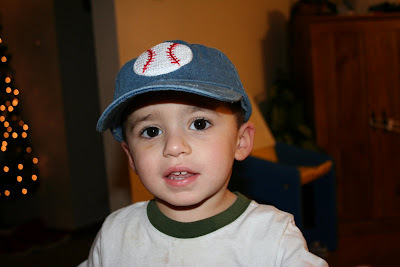 This adorable denim baseball cap is great for little sluggers! 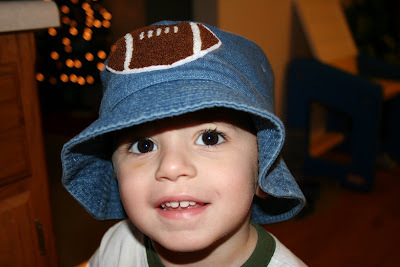 Their denim caps are 100% cotton with grommets and have an adjustable Velcro rear closure. Available in infant and toddler sizes. 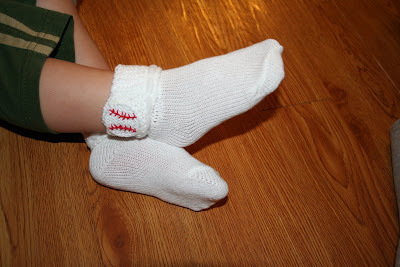 Matching baseball socks that actually STAY on the baby's feet! Pea Soup has offered all my readers a discount of 15% just enter coupon code: BLUE15 (off of total order, not including tax and shipping charges). This code will be valid until 2/1/09. Pea Soup has also offered to giveaway a infant/toddler denim baseball cap embellished with a crocheted baseball (their most popular style) to one of my luck readers. First Entry (Mandatory): Visit Pea Soup , then come back here and leave a comment telling me what accessory is your favorite. 5. Post on your blog about this and link back to Pea Soup & Me ! I would give this to my grandson. It's adorable. He has the Peasoup Hat with the football. I like the skull socks! My son would love this. the Pea Soup giveaway is great. Cool giveaway. My favourite are the prince cloud baby boy socks. If I won the hat I'd give it to my nephew Jacob (10 months old). I like the Basketball Baseball Cap! The Silk Flower Bucket Hat is very cute! I like the silk flower bucket hat. I would give this to my niece or a friend who just had a beautiful little girl. I love the Baby Moses Baskets! 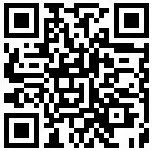 Following you on twitter, I'm lizzydear. I love their customized photo albums! What a great idea! My favorite is the Silk Flower Bucket Hat. Thanks for the giveaway! I would give these to my friend who just found out she is pregnant. how cute! I would give it to hubby's nephew, his birthday is in Feb. and they love baseball! I love the Swirl Heart Bucket Hat. My favorite is the Large Photo Albums. I like the Cupcake Soft Headband for my daughter. Hope to win. Happy New Year! I really like the pinwheel socks. So cute! I love the Silk Flower Bucket Hat! I like the Silk Flower Bucket Hat in white or lavender. If I win this, I would give it to my cousin's youngest son. Thanks! I LOVE the pinwheel socks!! I love the swirl daisy bucket hat. I would actually give the hat to my daughter, who is a big sports fan! I would love to win this for my grandbaby! I would give this to my friend for her son. I like the Velvet Rose Soft Headband. I would give it to my 8 month old son. I Loved The Swirl Daisy Bucket Hat! I like the Puppy layette. I heart the Baseball Cap! I love the Lavender Daisy Stand Pinch Clip Holder!